In the last year, one of my favorite pastry shops has become addicted to almond extract. They put it in short bread, pound cakes, croissants, brioche, pear tarts, financiers, you name it! Almond extract tastes cheap, and cheapens all it touches (one man's opinion). It also makes the above listed breads and desserts taste the same. Someone at BeauFort London loves "smoke" as much as my old bakery loves almond extract. And smoke, or at least the powerful smoke note BeauFort London apparently adores and craves, dominates BeauFort's perfume compositions and makes them all smell alike. BeauFort London offers three fragrances in its Come Hell or High Water fragrance collection: 1805 (smoke, gunpowder, "blood," brandy, sea spray, citrus), East India (tea, tobacco, opium, whisky, "religion") and Coeur de Noir (black ink, spiced rum, "paper," leather, vanilla, pipe tobacco, birch tar, labdanum). Though the listed notes of these fragrances sound fantastic to me, the actual scents are almost identical due to a ferocious smoky note. 1805 smells of food smoke (reminded me of the aromas of Smithfield, Virginia, ham smokehouses), East India presents wood/yard-waste smoke (imagine you've been burning leaves for WEEKS, wearing the same sweatshirt, jacket and jeans: you're smoke-dried). Coeur de Noir lightens things up (by a molecule or two) with vanillic smoke (think campfire, with marshmallows aflame). Buy some Liquid Smoke and save a bundle! Only after a hot shower did the underlying notes of these fragrances become detectable; perhaps the problem is in the "recipe?" If the smoke had been a backdrop and not the domineering note it is here, things would have been more pleasing and interesting. Like smoke, perfume brands rise, then disappear. I wish BeauFort London the best, but hope, in its next release, smoke of all types will be banished. In the "old days" I just might have bought one of these perfumes unsniffed; I found the listed ingredients tantalizing. Now, in my perfume dotage, I know a list of intriguing notes tells me zilch about how a perfume will smell. Please, share (admit to) a purchase you made based solely on ingredients...that brought bitter regret the moment you wore the perfume. BeauFort London 1805, East India and Coeur de Noir are £95/$140 for 50 ml Eau de Parfum; they are available in the US at Twisted Lily. Update: East India is now called Vi et Armis. 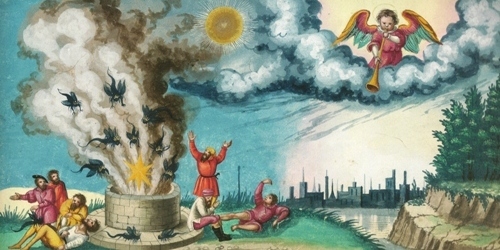 Note: top image is Augsburger Wunderzeichenbuch — Folio 182: Der fünfte Engel bläst seine Posaune via Wikimedia Commons. Awww Kevin! If you tasted my world famous fudgy brownies, with just 1/4 tsp of almond extract in them, you would be won over! Without the extract, the flavor just doesn’t pop! Perfume regret: Luckily, just a sample, but Chloe’s Roses de Chloe was “funeral home” on my skin! I love rose and appreciate it in perfume, but evidently not front and center! JGA…funeral home, ha! About the worst association one can have with perfume. Almond extract must be the Iso E Super of cuisine. Anyway, it’s a shame that these fragrances don’t seem to be as piratical as their notes would suggest. Uday: good one (Iso E Super) ha! I blind bought Malin + Goetz Dark Rum based on its rum and leather combo and the rave reviews on Mecca cosmetica. It had immense lasting power (unfortunately) but made me think of my mother’s food pantry cupboard after the Christchurch earthquake – when every jar, jam, food essence, honey, pickles, chutneys, bottled fruit, rocked off the shelves and smashed on the floor…a real collision of rum essence and goodness knows what . Drove me nuts…drove me almonds!!! BUT someone with more perfume knowledge than me now has my bottle and likes it…so that’s good. Kanuka…great description…and I agree with you on this one! Aqua Allegoria Pamplelune–big mistake. Not for me. I have your almond extract problem with truffle oil. To be clear, I like mushrooms a lot…and shaved white truffle on scrambled eggs was an experience I would happily have again… but the scent and taste of truffle oil on everything these days just makes me gag. My husband gets this very worried look when we go to a restaurant and I can sniff out the truffle oil.. he knows it is going to end in tears! It is not a flavor! It is a flavor eraser. Bleckh! Fantastic age …so interesting…but ‘son’s bedroom’ is not an appealing perfume note. A total aversion to fresh air seems to have set in. Still not as bad as truffle oil. Oakland…no truffle oil in my house! Fish sauce can also take over a dish if not used wisely. I actually like truffle oil but if it’s not used in tiny doses, and I do mean tiny, it’s just awful. It will take over the entire plate. Duchaufour, L’AP, incense, plum, rose, etc., not to mention beautiful deep plum matte glass bottle. What could possibly go wrong? Yes, never smelled that one, but can’t IMAGINE not liking it. And the fact that I can’t imagine not liking it is almost a sure sign I would not like it! Someone would probably like it. The only other Duchaufour that I can’t stand is L’AP Patchouli Patch, and many commenters like that one. Someday I’ll swap away AdV or sell it on ebay. AdV has fabulous reviews and seems very popular so I’m sure you would have no trouble selling or swapping. However, the bottle is so lovely… I’v realized that when a perfume is also a gorgeous object I struggle much harder to part with it – regardless of the actual scent! I too was sucked in by Turin’s dithyrambic review. Turns out there must be cumin in it as it reeked of BO on me and I had to get rid of it asap. You were wise! For two or three years, I would try it once or twice a year, thinking it would surely grow on me, but no. Kevin, I usually agree with LT; for example, I ordered Canoe Goods Skive based on his review, and I love it. But those few misses were major fails, LOL. I ordered Skive several days ago, based on its description & Turin’s glowing review. I hope it turns out to be great, when it it turns up – the package is being held hostage by the post office. They claimed they delivered it on Sunday (yeah, right!) and now they are “looking for it”. For the record, the Canoe Goods staff was super nice when I emailed them & offered to send a replacement bottle right away. What a pity because the name of the collection rocks! Anyway, this was strange as I have to say that the scents are very similar. HOWEVER, in the bath today, I had a eureka moment. The conditioner has quite a strong almond note! I saw it had almond oil on the ingredients (unlike the shower gel) but had somehow assumed this was for the moisturizing property only and would not influence the scent…until – hello! I am a crass creature that likes almond in all its forms, including almond extract. :O People like me are why your former pastry shop of choice go down such dark paths. What a pity that this perfume collection has a fantastic name but an overdose of smoke. Note lists have steered me wrong so many times. Thankfully this was only a sample, but Sacrebleu Intense by Parfums de Nicolai and I don’t get along. The reviews I saw used flowery language and issued high praise, and nothing in the list of notes sounded like it could possibly be objectionable. But then I sprayed it on and was majorly disappointed by some day old fruit salad that someone spilled cosmetic powder into. Also, Elixir des Merveilles by Hermes, which I bought a cute mini-bottle of. The list of notes sounded delightful and tasty, but I trusted Hermes to keep it classy. I was so pumped. Then I dabbed some on and regretted it immediately. Stale chocolate-orange biscuits and resin so dusty and cloudy I can only describe the whole experience as claustrophobia-inducing. Minteacup…hey, we had a similar experience with the Hermes! I’m totally missing the point of the many Merveilles, too. Which kills me because so many people like them, and the bottles are great. Financiers! LOL! What does actual opium even smell like…?! I think I’m the opposite, if I read notes that I don’t like I very rarely test the scent. That tendency saves me a lot of money however. The almond extract anecdote reminds me of when my sister brought back pure vanilla from a trip to Dominican Republic a few years ago and gave our grandma who bakes cakes for every occasion a bottle of it and eventually we had to nicely tell her to stop using it or use only a dash! Chandler…I think opium smells smoky! Ha! I put vanilla beans in everything sweet…can’t get enough. Danaki…give it away or sell it! Voleur de Roses. In theory I thought it would be this wonderful dark gothic rose. The reality of it was that I smelled like moms basement after she had a water leak. Mildew and stagnant air. Not a gothic rose to be found. Awful stuff.